YANGON, Myanmar - Wrapping up a historic three-day visit to Burma on Friday, Hillary Rodham Clinton met for a second time in as many days with former political prisoner Aung San Suu Kyi, this time for a more formal meeting at the lakeside residence where the Nobel laureate was kept under house arrest for much of the last two decades. Suu Kyi and her staff welcomed Clinton, who greeted Suu Kyi with two kisses on the cheek, saying: "It is just a great honor for me not only to be here but to see all of you." Clinton's meetings with Suu Kyi were the highlight of the U.S. secretary of state's visit to the long-isolated country known as Myanmar and forcefully underscored a U.S. challenge to Burma's leaders: The new civilian government must expand recent reforms, including the release of political prisoners, to improve relations as it emerges from more than a half-century of repressive military rule. "We believe that any political prisoner anywhere should be released," the Clinton told reporters on Thursday. "One political prisoner is one too many in our view." U.S. officials warned that even the modest incentives Clinton offered to Burma's new, military-backed leaders this week would come off the table if the country fails the political-prisoners and other tests of reform. Clinton offered a small package of rewards for steps President Thein Sein and other leaders have already taken but said the U.S. was not ready to lift tough sanctions on the country. Removing some of those sanctions would require approval by Congress, where many lawmakers have criticized the Obama administration for rewarding Burma too quickly without enough evidence of change. The modest first steps Clinton announced include Washington no longer blocking enhanced cooperation between Burma and the International Monetary Fund that could lead to the approval of much-needed loans and support for the poorest nation in the region. Also, the U.S. would support intensified U.N. health and microfinance programs and resume bilateral counternarcotics efforts. Those steps could be followed by an upgrade in diplomatic relations between the U.S. and Burma, Clinton said, although U.S. officials stressed that concrete action on American concerns must be completed first. The U.S. has not had an ambassador in Burma since the early 1990s and is represented now by a charge d'affaires. Clinton delivered letters from President Barack Obama to Thein Sein and Suu Kyi, in which Obama expressed hopes for better ties. The secretary of state made the point directly in her public remarks. "I came to assess whether the time is right for a new chapter in our shared history," Clinton said, adding that the U.S. was ready to further improve relations with the civilian government in the Southeast Asian nation -- but only if it stays on a path of democratization. A senior U.S. official said Thein Sein had outlined his government's plans for reform in a 45-minute presentation in which he acknowledged that Burma lacked a recent tradition of democracy and openness. He asked for U.S. help in making the transition from military to full civilian rule, according to the official, who spoke on condition of anonymity to describe the private diplomatic exchange. Clinton's trip is both a mark of approval, and a prod to further reform. The U.S. is "encouraged by the steps that you and your government have taken to provide for your people," she said, but those steps must be consolidated and enlarged. "While measures already taken may be unprecedented and certainly welcome, they are just a beginning," she told reporters. "We're not at the point yet where we can consider lifting sanctions that we have in place because of our ongoing concerns about policies that have to be reversed. But any steps that the government takes will be carefully considered and will be matched." In addition to calling for the release of political prisoners and an end to ethnic violence, Clinton said the U.S. wants to see a truly open political system and improvements in human rights. She also warned the country's leaders to break suspected illicit military, nuclear and ballistic missile cooperation with North Korea that may violate U.N. sanctions. "Better relations with the United States will only be possible if the entire government respects the international consensus against the spread of nuclear weapons ... and we support the government's stated intention to sever military ties with North Korea," she said. In his presentation, Thein Sein vowed that Burma would uphold its U.N. obligations with respect to North Korea, according to the senior U.S. official. Thein Sein also told Clinton that Burma was actively considering signing a new agreement with the U.N. nuclear watchdog that would allow unfettered inspections of atomic sites in his country, the official said. Nyan Win, a spokesman for Suu Kyi's National League for Democracy party, welcomed the U.S. rewards and said, "The incentives will help promote better relations and a better future for the country and I hope the government will expand its reform process." 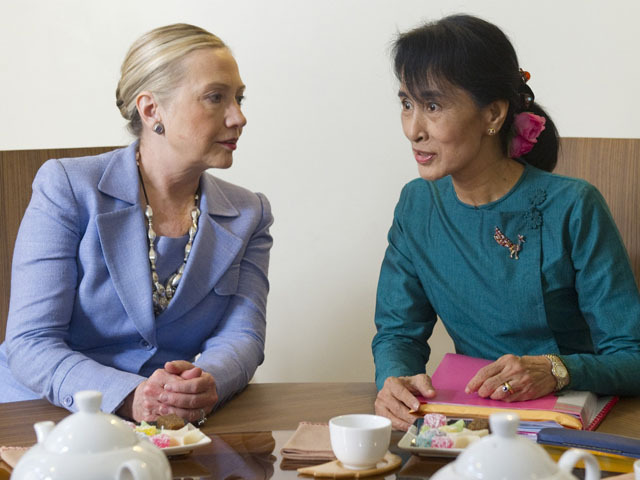 Clinton rejected the idea that the U.S. outreach to Burma was partially a response to the growing regional influence of China. "We are not viewing this in light of any competition with China," she said. "We are viewing it as an opportunity for us to re-engage here." "We welcome positive constructive relations between China and her neighbors. We think that is in China's interest as well as in the neighborhood's interest," she said. Recalling Obama's mention of "flickers of progress" in Burma when he announced that Clinton would visit, Clinton urged leaders not to allow them to "be stamped out." "It will be up to the leaders and the people to fan flickers of progress into flames of freedom that light the path toward a better future," she said. "That -- and nothing less -- is what it will take for us to turn a solitary visit into a lasting partnership."